alaTest has collected and analyzed 16 reviews of Proline TCF 2 NOIR. The average rating for this product is 3.0/5, compared to an average rating of 4.4/5 for other products in the same category for all reviews. Reviewers are impressed by the maintenance and design. The reliability and price also get good feedback, whereas some have doubts about the size and usability. We analyzed user and expert ratings, product age and more factors. Compared to other products in the same category the Proline TCF 2 NOIR is awarded an overall alaScore™ of 77/100 = Good quality. it fused my whole house !!! after about a weeks use i plugged it into the mains and a blue spark shot out of the back of it and it fused my whole house. beware if you break the jug....! 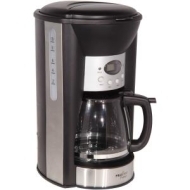 I've had this product for over a year and used it almost everyday for an early morning brew, using the timer. It replaced 3 useless Teasmaid machines and I have been delighted with the result: hot coffee, reliably, at a fantastic price. Do you like cold coffee? The coffee comes out way too cold and the warming plate doesn't do a very good job of keeping it warm. I think this was an excellent purchase. Did not expect it to be this good for the price. This products worked fine for the first two months but I haven't had a hot cup of coffee since. Something must be wrong with the heating element. I guess I got what I paid for. I do not recommend this product if you enjoy brewing coffee daily.